Run Jen Run: I signed up for the Cape Cod Beer Race to the Pint! 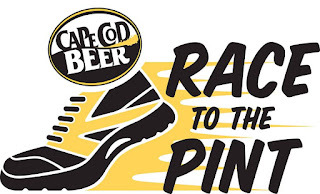 I signed up for the Cape Cod Beer Race to the Pint! A Saturday afternoon 10k on the Cape that starts and finishes at a brewery? In its first annual race, the Cape Cod Beer Race to the Pint offers a 5k and a 10k race with free beer (or wine!) for all runners of age. The post race party features food from Not Your Average Joes, food trucks and a fun, local band—57 Heavy. I’m actually pretty excited for its 4pm start time and to race the 10k distance. (The last 10k I ran was the Tufts 10k for Women in 2014.) For me the race falls about a month before the Buffalo Half Marathon and on a weekend I was supposed to run 6 miles for my long run. It will be a good test of my fitness and the post-race party should be a good time.